So, Saturday both yours truly and the FP had to work. So when we got home, we were starving. We needed food fast, so we went to maybe the worst place for that - Bangkok Thai on El Cajon Blvd in the old pizza hut looking building. Why do I say that? Because it was around 3 pm, and for some reason, the place was pretty busy for that time. And there was only one server. It took us forever to get water, which is usual everywhere else, but this place. They usually give us a carafe of water right away. Not this time. We were dying of thirst of course. Then we finally got the water and ordered. The FP was getting edgy, but alas, after minutes and minutes of staring at the other diners and trying to find out what number we were in the lineup, our beef salad came. I think it's called waterfall. Anyway, it was hot! It was both hot temperaturewise and spicy scale wise. We asked for it to be a 6 - at my request. It was a 9 or 10. Even the FP thought it was hot. No matter what level we ask for this dish, it's always hot hot hot. But it's really good. Steak, cucumber, cilantro, red onion, tomatoes, vinegar, soy, and there's something else I can't remember.... oh yeah, chiles...lots of them! So then I got some noodles, and damnit, I can't remember the name on the menu. Anyway, it's one of the ones with the pepper next to it - indicating that it's spicy. I ordered that at the heat level of a 6 as well, so I was prepared to have my head blown off. And of course we had ran out of water by that time with no chance for more. So my noodles came, and they were a 3 at best! I think they used all the heat for the beef salad and didn't leave any for my noodles. Anyway, we had the condiment tray. I don't even know if I used it because I still had residual heat from the beef and no water. 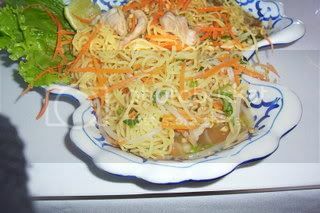 My noodles dish was similar to a pad thai, but with wheat noodles. It was kinda room temperature. I'm not sure if it was supposed to be, but I figured it was since pad thai is never hot temperaturewise either. I ordered pork, and the pork was purely incidental, but the noodles were good. There was a "brown sauce" which was , you know, thai tasting. Vinegar, sweet, spicy, and it had peanuts, carrots, green onions and bean sprouts. I gobbled up the whole thing. The FP had red curry with combination proteins. He always gets the combination. It was delicious. Really. It always looks like it's just not going to be great with those bell pepper strips, but then it ends up being great. It was sweet and nutty. I mean, nutty coconutty creamy goodness. And there is so much sauce to put over the rice. I could probably just eat the rice and sauce and be satisfied. He devoured his as well. As we were leaving, it seemed that the second shift had gotten there too little too late. Oh well, when the food is good and the prices are decent, people tend to have more patience. I don't know if I've rated this place before, but what the hell... 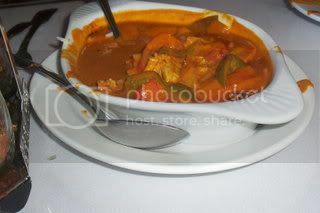 I give this meal at Bangkok Spices Thai Restaurant at 2832 El Cajon Blvd. a \/\/\/\ 7 out of 8 choppers. 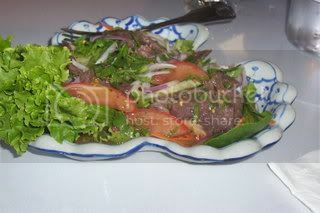 HI TFH - Fine post, the prices here are pretty good, and tho' the food is a bit Americanized for my taste, it is not bad. We haven't gone to many Thai places here, but we haven't really found anything amazingly spectacular, but other asian places are great. What gives? Are we not looking hard enough? I don't want to be a downer, but most of the Thai Restaurants in town play it safe. Which is why we end up going to LA for Thai....most places are those pick your sauce, pick your protein places, and the flavors have been adjusted for the American palate.